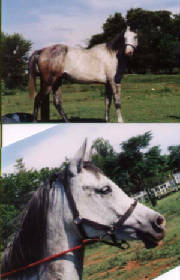 This 15hh grey gelding was born in October 1994, and he has a rather quiet nature with lots of character. He has completed several endurance rides, with a total distance of about 800kms. His current owner is Graham Anderson with Tracy riding him. 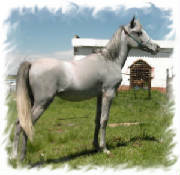 Sadheen is a exceptional bred stallion. Born in August 1997, he lived for 2 years with us. He was then sold as a two year old to Mrs. Alida Jacobs where they were breeding him to partbred mares, producing lovely riding horses for them. He is still a stallion with a lovable temperament, showing only tenderness to his human companion. He has also done several endurance rides with over 700 kms behind him. This very refined chestnut colt was born in December 1994 and were shown at some shows that next year, where he was spotted and we sold him as a yearling. 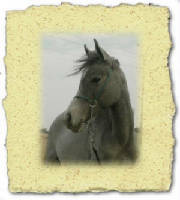 He is currently being used as the head stud sire at stud at Mr Oosthuizen in Augrabies, Northen Cape Province. Adir is very unique as he is chestnut in colour, with both his parents being Grey. 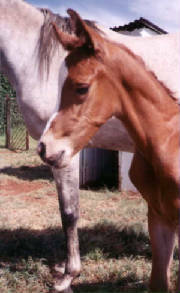 Shahlifah was our first born filly-foal and was born in November 1995. We felt very proud for having her for almost 5 years of her life. She is currently living in the Limpopo Province, in Pietersburg, producing some lovely offspring for her new owner, Theo & Elize Jordaan of Telize Arabians. 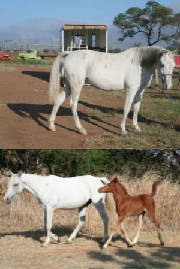 The foal with her, on the picture is Telize Jamila who is sired by MH Nasr [*Bay Oaks Beystone x Sidi Egyptian Queen]. Ariq El Sem is Ariq Shahlifah’s first born son before she went away to her new owners. 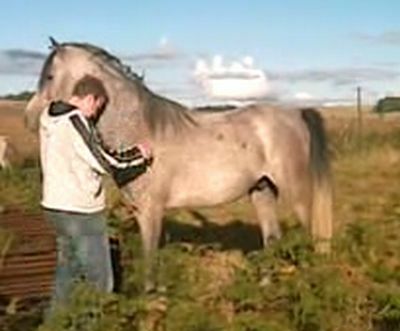 El Sem’s sire, Khalil Poison, is bred out of the mare, Ryhom Siwa [Vidiko Ga’El Grey x Nefud Nezira] and was sired by the multiple champion stallion, *Maistro. 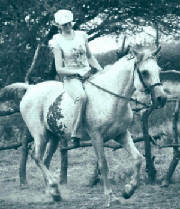 El Kaddal was born in 2005 out of our foundation mare, Minhab Kadira. He is also one of the last foals sired by the deceased Egyptian stallion, Ibn El Imdal. 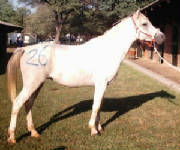 He was recently sold to Kromar Arab stud and will perform stud duties on the Steynberg's Arab mares. 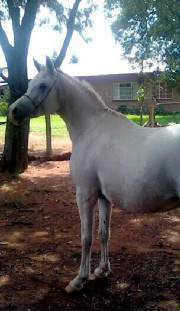 This Egyptian-related stallion has been recently sold to Me Chantell Stimie in Pyramid, Pretoria. There he is furthering his breeding and riding career with her mares and is also available for outside breedings. This beautiful grey filly was sold as a yearling to Mr. & Mrs. Paul Marais, who resides in Great Brittian She'll be their great future broodmare. This lovely filly is now in possesion of Kromar stud too, where she'll be bred to there stunning stallions when she's old enough. This is the full sister to our beloved mare, Ariq Haliira and is now owned by Alan & Michelle Browne of Al-Miduk Arabian stud where she’ll be competing in endurance races for the next few seasons.